Theatre Cares Vancouver has raised $28,000 in support of local Aids organizations, AIDS Vancouver and Positive Living BC, in addition to The Actors Fund of Canada (AFC) which assists professional Canadian entertainers maintain their health, dignity, and ability to work, the Performing Arts Lodge which provides safe and affordable housing for people in the creative community, and the Stephen Lewis Foundation, an organization dedicated to the relief of the HIV/Aids pandemic in Africa. Each of these charities will receive financial support from Theatre Cares. Huge thanks to the staff and audiences of The Arts Club Theatre and Bard on the Beach who made this possible! The Stephen Lewis Foundation works with community-level organizations that are turning the tide of HIV&AIDS in Africa by providing care and support to women, orphaned children, grandmothers and people living with HIV&AIDS. Since 2003, they have funded over 1,400 initiatives, partnering with more than 300 community-based organizations in the 15 African countries hardest hit by the global AIDS pandemic. These grassroots groups are the lifeline for their communities: they provide counselling and education about HIV prevention, care and treatment; distribute food, medication and other necessities; reach the sick and vulnerable through home-based health care; help orphans and vulnerable children access education and work through their grief; and support grandmothers caring for their orphaned grandchildren. 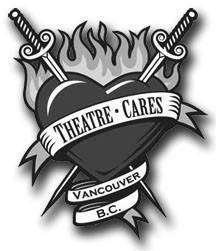 Without the generosity of the theatre patrons and the support of local theatre companies, Theatre Cares would not be able to do the work that it does. Our fundraising over the years has benefited PAL Vancouver, the Coast Foundation, Triage Emergency Services & Care Society, Camp Moomba, PEERS Vancouver, Electric Company and the Positive Women’s Network, a partnership of women living with HIV/AIDS in British Columbia.